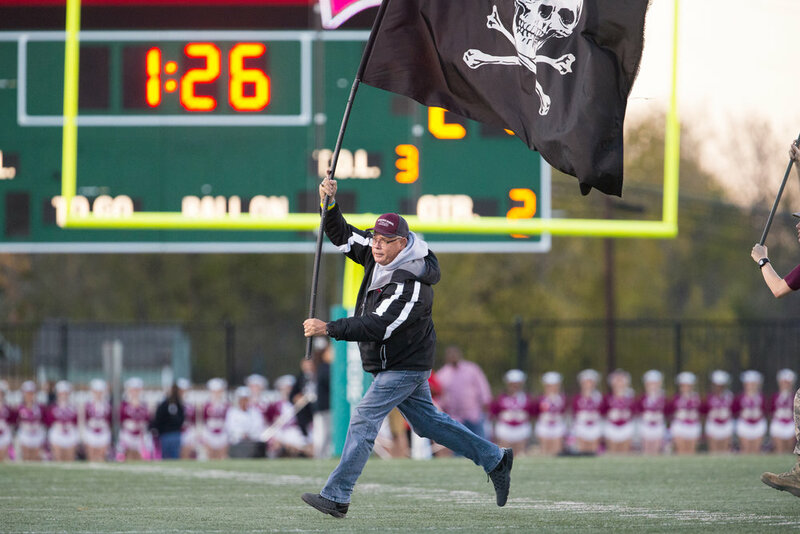 Wylie principal Virdie Montgomery runs with the flag on the field after a Pirate score. Wylie opened the playoffs with a 38-28 win over McKinney at Wylie Stadium to claim the Bi-District championship. After starting the season 0-4, Wylie won five of their last six to make the playoffs thanks in part to improved quarterback play from Rashad Dixon. Dixon led the Pirates with 151 yards rushing and three touchdowns against McKinney while Caleb McCrayh and Malik Ford each pulled in five receptions with Ford scoring once. In the Area round of the playoffs Wylie matched up against a team that also had a slow start to the season in Mesquite Horn, who started of 0-7 on the season and made the playoffs by winning their last three games. Horn then upset Temple in the bi-district round to set up their game with Wylie, which was played at Mesquite Memorial Stadium. Wylie and Horn were tied after the first period 7-7 but the second period was an offensive explosion with the teams scoring 38 points in the period. The Jaguars went up early in the second period and then the lead changed four times with Horn scoring last with 10 seconds remaining in the half to take a 28-24 lead. Wylie looked to reclaim the lead on the opening drive of the second half but Horn intercepted a pass in the end zone and proceeded to score giving them a 35-24 lead that the Pirates could never recover from leading to a 49-31 win for the Jaguars. Donovan Ollie had 132 yards receiving on eight catches and one touchdown to lead the Pirates offense and Dixon passed for 262 yards and rushed for 139 yards and three touchdowns on the night.